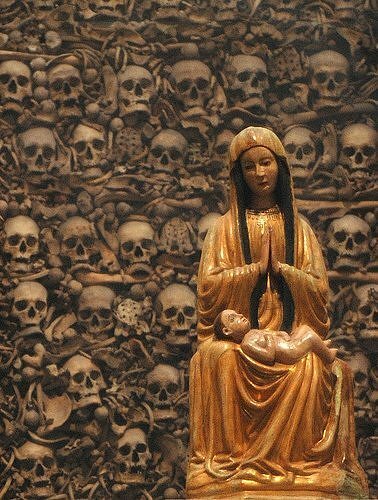 There are 800 “Holy Skulls” inside the Otranto Cathedral in Southern Italy. Hundreds of them overlook the alter with an idol of Mother and child. 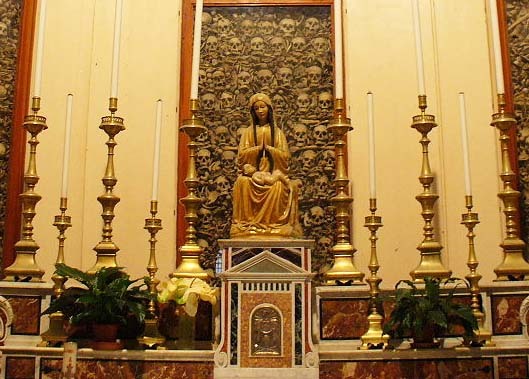 Hundreds of skulls looks down at the alter of this Catholic Chuch in Southern Italy. 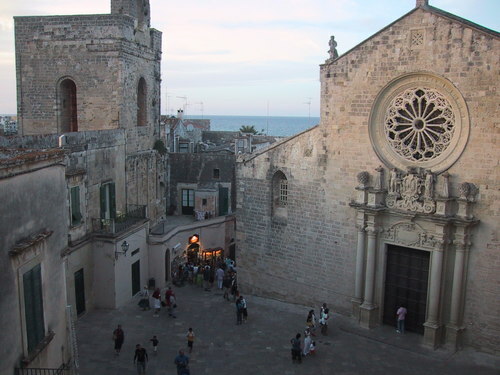 “According to the Roman Martyrology, August 14, the Church remembers and venerates “… the approximately eight hundred martyrs of Otranto, in Puglia, pressured to renounce the faith after the crushing assault of the Ottoman soldiers in 1480 A.D. The idol of Madonna and Child have quite a few onlookers. You have to be very choosy nowadays, because it is possible in our days, to sit a cry from the morning to the evening. This is the Church of Ortranto. 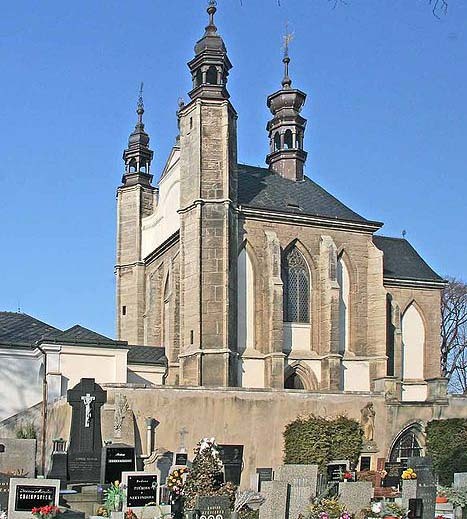 This chapel is found in the suburb of Kutna Hora in the Czech Republic. 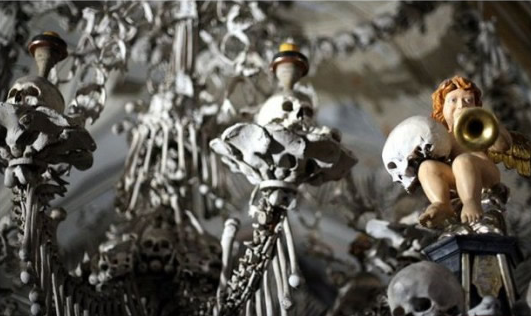 There are not less than 40.000 human skeletons inside this Roman Catholic Chapel in the Czech Republic. 40.000 people in Prague have to look for the skulls of their relatives inside the decorations of this Church. Each skull inside The Skull Chapel in Sedlec in the suburb of Kutna Hora in the Czech Republic has a silent story to tell. Both skulls and angels have been used to decorate the full church. First When I have seen a bony Roman Catholic Sun monstrance with a skull in its center, I can fully understand the wickedness of the dead end that “Eucharist celebration” truly represent. 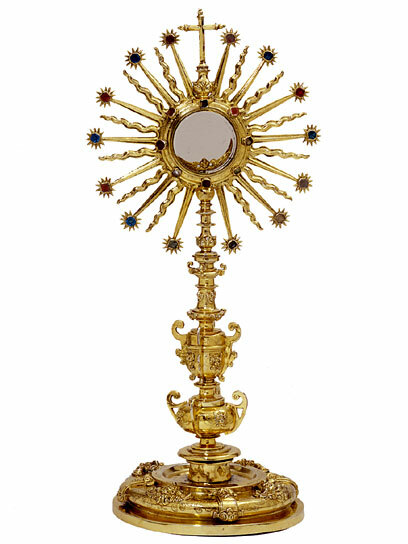 A Catholic monstrance that holds the wafer of the Eucharist. The bony Catholic monster’ance in this Church in Prague. 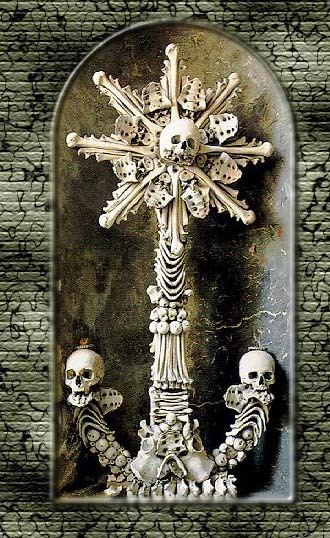 Roman Catholic symbol made with bones of dead people. And just when you thought you could no longer be shocked by conducts of religious people: If you have never seen Satanic art, this might still catch you by surprise. A priceless example of how dead people can decorate a full Church. Not only look down on people from the ceiling. But also reappear as a chandelier to please the Vatican. 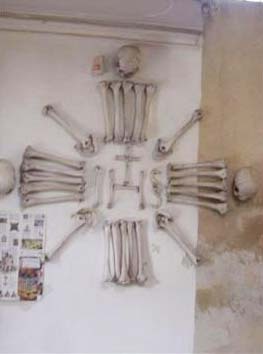 The skeletons have been artistically arranged to form decorations and furnishings for the chapel. All the bones were the victims of the Silesian wars and epidemics. When I look at the pictures from this Roman Catholic Chapel, I simply do not find words than explain my feelings. But I know that none of these butchers and people who call them ‘Holy” shall not escape the fire of Hell. You have to be extremely evil, to be able to find more demonic inspired art than in this chapel. Everything inside this “Church”is made of skulls and bones. From the light holders to the very furnitures. Here is a Bible verse that can express the men who made this, and took inspiration from the botomless pit. Is there anybody on the face of the Earth who after reading this article, can not see that this verse fits perfectly on the Roman Catholic priesthood? MAMMA MIA!! WHAT IS THIS CRAP!! I feel sick to the pit of my stomach. Sheesh!! Good Lord Jesus how can the Catholic people be so blind to let this evil pass over their eyes? I’ve seen too much of this since the past few days and it’s as if I have been surveying a museum in hell. Lord Jesus cover me and others using this blog with Your Precious Blood and keep us under the shadow of Your Wings for protection… Amen. This is truly evil … a cult and the occult. Ivar, I am so glad you are writing these stories about the bones. This is beyond disgusting and seems to be a celebration of death. It might seem to be close to impossible but. Tomorrow I will publish something more shocking. And be prepared for a rocky week ahead. Because I have found information that needs to be exposed. “So do not be afraid of them. There is nothing concealed that will not be disclosed, or hidden that will not be made known. What I tell you in the dark, speak in the daylight; what is whispered in your ear, proclaim from the roofs. Like Elijah, we must not be afraid to expose the evil deeds of darkness done by these blunt Baal worshipers. Beautiful??? OMG! HappyJumper are you kidding? You have some weird taste. Yeeewww??? It’s a Satanic church, a haunted house, it’s darn spooky!! Here is a video of it in HD with music. A small Roman Catholic piece of Hell on Earth. I will put this video up on the blog shortly. Oh well, I guess you can’t see it here. First of all the explanation of”1 Timothy 4:1-3″ is wrong. It says nothing about priests not being able to marry. These churches with the bones are not trying to show any demonic symbolism. Remember the time period this church was built. these bones are a symbol of the devout catholics that were killed for there faith… it is a great honor to know that while you spirit lays in heaven for dying for your faith your body lays in the church were Jesus is present… Once again fellow loving Christians these skulls are not there because of some demonic symbolism but there to show the people that died for Jesus by believing in him. I love you and thank you for reading… please get more information before you try to condemn the church and dont be so close minded. First of all the explanation of”1 Timothy 4:1-3″ is wrong. It says nothing about priests not being able to marry. Indeed, it does not mention priests, as the Bible does not mention priests as being a part of a Christian church whatsoever. Jesus does not dwell in earthly temples, but in His temple: you, me, and all of mankind. Those who die in Christ will be in His presence, no matter where it is their body lies. Dying for the faith isn’t about honor because all true Christians are unquestionably willing to contend. Once again fellow loving Christians these skulls are not there because of some demonic symbolism but there to show the people that died for Jesus by believing in him. Whether or not their intent is sincere, this display is one of death, and Jesus conquers death. Those who believe in Him will never truly die, as it is written. please get more information before you try to condemn the church and dont be so close minded. We must be close-minded, for Satan so ever wishes to be let in. My mind is closed, but my heart is open. 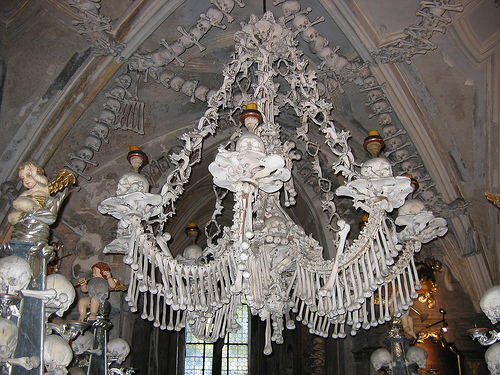 Sorry but when they make chandeliers out of human bones there is NOTHING honorable about it…this is sick stuff no matter how you try Explain it!!! Come out of her!! Rev. 18!! And this includes the Protestant daughters who have continued sun worship and pagan syncretism in the NON-biblical holidays of christmas and easter. Abba!! Open eyes! Unstop ears!! Please! Time is so short! The Catholics did not kill the Martyrs. They were just trying to honor them by putting their remains in God’s house for as long as humanly possible. This was to remind Satan of the Martyr’s Victory in Christ. Obvously, you don’t like it. Just like Satan doesn’t like it. I will pray for you. The Catholics did not kill the Martyrs. They refused to accept the papacy, and refused to bow down and kiss statues of the “Queen of Heaven”? You need to read about the Spanish Inquisition. Even the Roman Catholic Church admit that their religious tribunals killed and burned people, who did not accept the rules set by the claimed to be “Holy father”. Hvis det er greit å si at sankt Klaus var hvit, er det også greit å si at pavene er i Dødsriket og uoppnåelige. old pope and his religion, not satisfied to have control of mens will’s and consciences while they are “living”. Even after death, they insist on imposing their formal religious theater on the remains of their dead, as these and similar examples prove. IGNORANCE AND PRIDE GO TOGHETHER. The comments in this discussion demonstrate how none have hte faintest idea of what they are speaking of and yet speak as if they did. HONOR TO THE MARTYRS OF OTRANTO WHO PREFERED TO DIE INSTEAD OF ABJURING CHRIST.